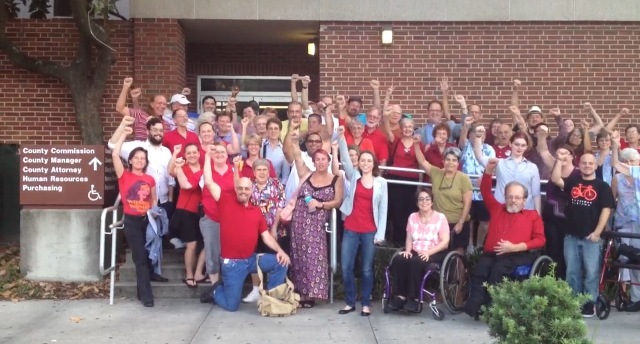 GAINESVILLE- On Tuesday, August 13, the Alachua County Commission voted 4-0 to add employment, housing and public accommodation protections for lesbian, gay, bisexual and transgender residents. Currently 6.4 million Floridians live in a community with protections based on sexual orientation and gender identity or expression. Other Florida municipalities that offer these protections include Leon County, Volusia County, Orange County, Palm Beach County, Broward County, Gulfport, Dunedin, North Miami, Miami Beach, Venice and St. Augustine. Since 2008, the City of Gainesville has had comprehensive protections for LGBT residents, but those protections are only within the city’s limits. The vote by the majority of the Alachua County Commission provides countywide protections for people who live or work outside of Gainesville’s city limits. Commissioners Mike Byerly, Robert Hutchinson, Charles Chestnut and Lee Pinkoson voted in favor of the ordinance. Commissioner Susan Baird was out of the room during the vote. Please take the time to email the commissioners who voted in favor of the ordinance, thanking them for their support.